Black bears, as a species, are highly intelligent, curious and inquisitive. They are also opportunistic feeders, especially as winter approaches. These characteristics, along with the expansion of the human population into bear territory, can lead to human-bear interactions. While not all interactions are bad, some can become conflicts if we are not prepared to handle them correctly. We can coexist with bears and other wildlife if we have the right tools and knowledge to do so. Once a bear has fed easily at a location, it can and will readily come back to feed again. This is especially true of young, inexperienced bears that find garbage cans provide an easier meal than foraging on their own. To avoid conflicts with bears, learn some of their behaviors. Behavioral misunderstandings have led to black bears being classified as dangerous, unintelligent, and clumsy. While black bears do have the strength and power to be dangerous, they are not inherently so. When given the choice of fight or flight, they will generally choose flight either by running up a tree or just running away. They often will also use a bluff charge to scare you away. Another misconception is that black bear mothers will attack humans to protect their cubs. This is generally false. Researchers often catch cubs when they are running up trees with the mothers in sight and no attacks have ever been recorded. It is good to note, however, that brown bear mothers have been known to attack humans and to keep in mind that their behaviors do differ from that of black bears. Regardless of species, we should never approach a bear if we come across one and give them space by leaving the area. Living in the country is a great thing and can bring you closer to nature. Just remember some of these tips so you don’t come too close to nature and lure a bear into your yard. If we all do a little to cohabitate with bears and other wildlife then we can reduce any negative conflicts and focus on the positive and appropriate human-animal interactions. Three black bears cubs cannot get enough of the tasty apples in the backyard. Although you never see her, mama bear is very close and keeping a watchful eye on her little ones. 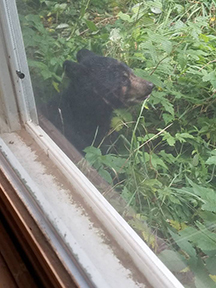 With bears living around you, check outside first before simply heading into the backyard! Apple trees and other fruit-bearing plants may draw wildlife, including bears, to the area so please take this into consideration when planting in close proximity to your home or other active spaces to help avoid human-animal conflict. Show your support for Wild Paws' mission of rescuing and providing a safe habitat for wild animals using sustainable resources, promoting coexistence between humans and wildlife, and educating the public about the preservation of wild animals and their ecosystems.